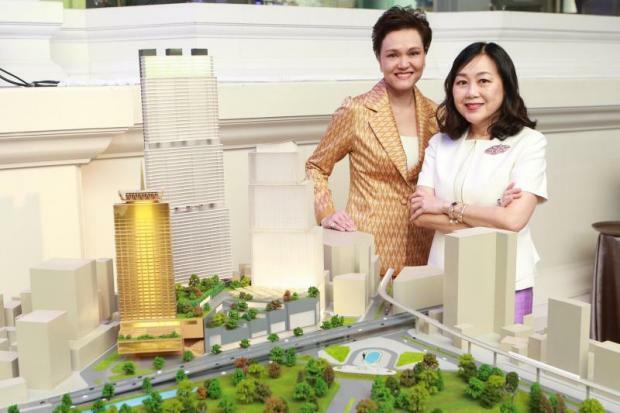 Mrs Suphajee (left) and Ms Wallaya display a model of the Dusit Central Park project, located at the intersection of Silom and Rama IV roads. Central Pattana Plc (CPN), the retail and property firm, and hotelier Dusit Thani Plc are committed to proceeding with their 36.7-billion-baht Bangkok mixed-use joint venture, endorsing the positive investment climate amid the political transition. The Mall Group and Siam Piwat Co recently announced investment plans of 50 billion baht and 70 billion, respectively, over the next five years. CPN and Dusit Thani’s development is planned for Bangkok’s central business district (CBD). The project, dubbed Dusit Central Park, will be developed on 23 rai of the plot owned by Crown Property Bureau where Dusit Thani’s flagship hotel, one of Bangkok’s first, was located for over 50 years. It will have a leasehold of 67 years. Suphajee Suthumpun, group chief executive of Dusit International, said Dusit Central Park will comprise four main anchors: a hotel, residential, retail and office space. Hotel, residential and retail business will be handled by Viman Suriya Co, the joint venture between Dusit Thani and CPN, which hold 60% and 40% stakes, respectively. CPN will handle the office segment separately. Mrs Suphajee said the company will build 250 hotel rooms in the 39-storey building. The hotel is scheduled to start operation by the end of 2022, followed by retail and office space in 2023 and residences in 2024. Although the operation of Dusit Central Park is taking longer than One Bangkok, another mixed-use project owned by billionaire Charoen Sirivadhanabhakdi, which is scheduled to begin operations in 2020, Mrs Suphajee said she still believes in Dusit Central Park’s competitiveness. “We believe our project is unique, easily connected to the main road and mass transit lines, both the skytrain and subway,” she said. Dusit Central Park aims to raise the bar to another level and make Bangkok one of the world’s best cities. Wallaya Chirathivat, deputy chief executive of CPN, said Dusit Central Park is not just another mixed-use space, but a new creation that will transform the area into the prime core of the CBD. Dusit Central Park aims to connect four Bangkok neighbourhoods in four directions: Ratchaprasong (north), Charoen Krung (south), Sukhumvit (east) and Yaowarat (west). The goal is to create a new junction where old meets new and financial meets commercial. “Dusit Central Park will be positioned to help bring Bangkok to a whole new level and set the standard for mixed-use projects in the city, as it is located next to Bangkok’s major park, Lumpini Park, just like the iconic properties found adjacent to parks in New York and London,” she said.